Reduce the appearance of cellulite by wearing neoprene workout pants as you exercise. If you, like many women, battle extra weight in the waist, hips, and thighs, you should try cellulite reducing exercise pants. These pants are made of a thick neoprene, something like a wet suit. The material holds in heat for the area the clothings covers -- here the stomach, hips, and thighs. Just wearing the pants around the house may help somewhat. You can wear them as a girdle, if you choose, to hold in some of the rolls and pudges. But maximum benefit comes from wearing the pants during exercise -- walking, Zumba, aerobics, biking, or jogging. We all know that fat doesn't come off just by rubbing on a cream or taking a pill. Maximize your workout results with Delfin bio ceramic exercise shorts and capris. What Benefit is Heat During Exercise? 1. Heat warms the muscles. You will have fewer muscle cramps when the body is kept warm. Your workout altogether will be smoother. Your muscles will work more efficiently, and you get more benefit from your workout. The water loss from sweat translates into lower weight on the scale. And more importantly, the skin of the hips, thighs, and waist feels and appears smoother and firmer. That means that the rippled texture of cellulite decreases, and your body feels trimmer. These are the basic anti-cellulite shorts. The fall high, slightly above natural waist so that the entire waist area gets the benefit of heat. And they are long, covering almost to the knee. All of your thighs get the anti-cellulite treatment with these shorts. The cut of the shorts is generous in the hips and thighs so that those with an ample "pear" shape can wear these easily. How many times have you gone to buy exercise wear just to find that the pants only fit skinny people? How ridiculous is that? Larger women need to exercise too! In fact, our larger bottom and thighs are probably the exact reason we are exercising! 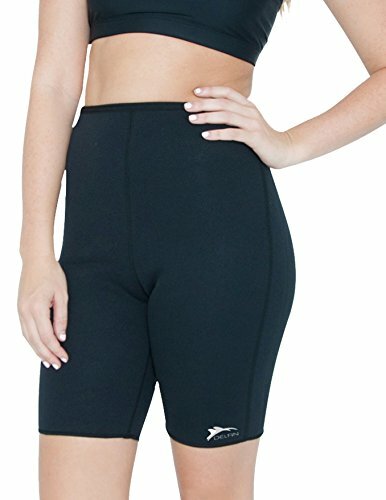 The makers of Delfin Bio Ceramic shorts created this exercise gear is for real women with real curves. Buy the size that matches your regular pants size. They are designed to be snug but not constricting. Everyone has different standards of modesty when it comes to clothes. For me, these anti-cellulite exercise pants are a bit too form fitting for wearing alone. So, I layer them with another pair of looser gym shorts on top. 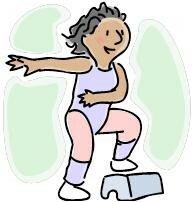 It may look a little odd, but the firmer thighs and hips are worth a strange appearance at my Zumba lessons. If you would like more coverage, even past the knees, go for these longer capri exercise pants. With the longer pants, you get more heat generated all along the leg. Fight the flabby knee situation with anti cellulite action targeted directly to the problem spot. Some women find the longer style more modest or flatttering, especially if they wear the exercise pants solo without another layer. I do recommend the neoprene exercise pants. I have a pair that I wear to the gym. They certainly keep my waist, hips, and thighs warm and result in a lot of sweat. In my experience, wearing the pants during exercise DOES result in firmer tone and reduced cellulite. It's not dramatic. I mean, I'm not a size twelve before Zumba and a size ten afterwards. That's totally unrealistic. But, yes, these pants do seem to keep me in my size twelve jeans instead of struggling to zip them up. If I exercised more often, wearing my anti-cellulite pants, I am sure I could lose enough inches to get back into my size ten jeans. I'll be honest. I'm not crazy about exercise. That's why I like these shorts so much. I get a little more benefit from my workout and it's targeted right where I need it -- waist, hips, and thighs. Good recommendation. I definitely need to exercise more but if this would make my exercise more efficient that is awesome. Will do some more research. Thanks. You had me at cellulite. Definitely adding to my Christmas wish list.